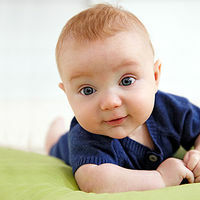 As he approaches 3 months old, your baby might hit a few new physical milestones, such as lifting his head 90 degrees while he's on his stomach (thank you, tummy time), rolling over to one side, and turning his head to follow a moving object -- or you strolling past. He'll also hit some of his happiest milestones to date, such as laughing out loud, squealing happily, clapping his hands together, and smiling at you. Suddenly you have an appreciative audience for all your new-mom antics, which makes it that much easier to flash funny faces and babble in baby talk. You'll also notice that your baby's sleep schedule will start to consolidate; instead of mini catnaps every 45 minutes, he'll start taking three longer naps a day, and he might even sleep for longer stretches at night. Keep him on track not by watching the clock but by following a basic routine each day: when he wakes up, feed him, play with him, then put him back down for a nap after two hours or so. Pay attention and you'll start to see signs that he's in need of some rest time -- he'll yawn, rub his eyes, or look away when you try to grab his attention -- so you'll know to put him in his crib before he hits the meltdown stage. With a daytime schedule in place, nights might go more smoothly, as well. If your little one's still up every few hours, try letting him fuss it out for a few minutes before you duck in to the nursery for a feeding. Teaching your 3-month-old to soothe himself will pay dividends when he learns how to fall back to sleep on his own. These signs could indicate something more serious than your average cold, such as RSV or pneumonia, so call your pediatrician for advice if your baby's exhibiting any of the listed symptoms. Meanwhile, spend an hour babyproofing your home. 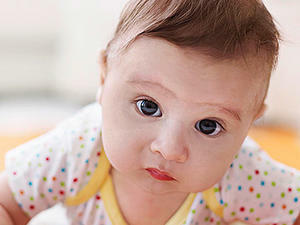 Though your little one won't be crawling or walking for many months, he might be more mobile than you realize. Put him on the floor and he can wriggle around, roll over, and reach out and grab things (such as food crumbs or lost hair elastics) that could pose a choking hazard. Keep an eye out for tiny objects that could attract your little one's interest, and put breakables up and out of the way. Your baby will hit mobility milestones faster than you can keep up with--better to be prepared now than surprised later. If you're going back to work, your maternity leave might be just about up -- and that induces all kinds of feelings, from stress to fear to glee. Undoubtedly guilt is part of that mix, but if you've carefully lined up reliable child care, there's no need to feel bad about leaving your baby behind while you provide for your family. Deal with your normal back-to-work jitters by finding a friend who's been through the transition (someone to whom you can vent when the nanny calls in sick -- again). As supportive as other staffers might be, only moms who've been in the same boat really get the swirl of feelings you're dealing with. For additional help and no-nonsense advice, find an online support group, such as our Working Parents community. In the meantime, do what you can to make the transition easier for your little one by doing a test run at the babysitter's. Introduce your child care provider to your baby (and all his quirks) and help your baby explore his new surroundings. Ask your boss about transitioning back to work slowly, with a three- or four-day-a-week schedule, or with a few half days so you feel more available to your baby. Then let go. Your baby will do fine -- and enjoying your life at work (and the time you have to grab lunch with friends without hauling along an infant car seat) does not make you a bad mom. On the contrary, it means that when you're together, you're more likely to focus your full attention on him. Quiz: Go Back to Work or Stay Home? Hold your baby will help her increase muscle strength and her physical development.